SHOES. Just like most of you guessed, the box contained a pair of shoes. But not any pair of shoes – THE shoes. I preordered them about 2 months ago and have been waiting like a child since, and yesterday they arrived! Yep, it’s the Sam Edelman Zoe Boots, finally! This entry was posted in Fashion, Shopping and tagged Sam Edelman, Zoe boots by Carolina Engman. Bookmark the permalink. Nej, jag dör. THE shoes?? Avundsjuk är bara förnamnet! Nej, förresten. SVARTSJUKA tror jag att det är. de va snyggare på din bild än på hans bild! Positivt. Wow, I love those shoes but the increase from the original price is kind of crazy! If I had the money I would probably still want to buy them though. How is the comfort level when walking? They remind me of Balenciaga shoes from a few seasons ago. You are so blessed to have them!!! 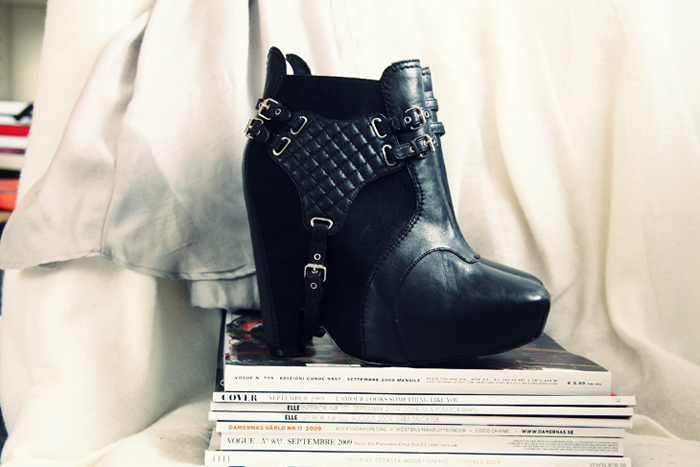 These boots are so amazing! I die , literary . Follow http://twitter.com/FashionBlogNews and never again miss any update of the world’s best fashion blogs! OMG you’ve got them! you’re such a lucky girl! I’m so curious how your shoe collection look like, could you post a photo of all your shoes one day? These are literally a copy of those famous Balenciaga shoes from a few seasons ago, I personally hate them, but the extra detail on these makes me like them a little bit more. these look so amazing! are they easy to walk in? :O !!! Var inte dem lite dyra?! Puh! Envy is a word that has just increased to serious levels! These shoes are so insane! Love them to no end, pretty sure you’ll make them work perfectly, as usual! hur är skorna i storleken? Jag har länge velat beställa dem, men är osäker på storleken. Vad har du för storlek i svenska skor typ dinsko, och vilken strl har du i dessa boots? Tack! looks like i’m not the only one obsessing over zoe shoes! So did I! I practically counted down the minutes until they arrived, and blogged about them on the first chance I had … beautiful blog! are they easy to walk in? i am thinking about getting them for myself for Christmas!